I really have been hopeless at posting on here haven’t I?! Life’s just been far too hectic. But here I am again and this time I want to share this little recipe for Syrian Prawns with you all. It’s a lovely, quick and easy one, great for those manic days when you just seem totally rushed off your feet. Slice the pepper, aubergine and courgette and grill on a medium heat. When the vegetables are starting to soften add to a pan with the harissa and tomatoes. Bring to the boil, then reduce to a simmer. Stir in the prawns and simmer for 5 minutes or until cooked. Serve with flat bread (I’ve just realised that I’ve never given you a recipe for flat bread, have I? That’ll have to be my next blog) or a side salad. Here’s a little dish that’s starting to become a regular favourite at the MacKay family dinner table. And the best bit, it’s vegetarian and vegan friendly too :). Bring the turtle beans to the boil in a pan of water then turn down to a simmer for 45 minutes. Boil the rice until just cooked but still retaining a bite. Slice the peppers and fry until they’re just starting to soften. Stir fry the spices in a pan for around a minute and then add the drained rice and beans along with the peppers, tomato puree and spices. Stir the pan over a low heat for a few minutes to ensure that everything is hot and well mixed. Fill the taco shells an serve with a salad, guacamole and enjoy. It’s been a while hasn’t it since I last shared anything and my blog’s been a little unloved and neglected. Well my New Year’s resolution is to try and blog more often, at least once a month if not weekly, we’ll see how it goes. I’ve got plenty to share with you, I’ve had some lovely trips to Algeria, Norway and Malaysia over the last 18 months or so and my notebook is packed full of yummy recipes that I’ve picked up along the way. This one is a very simple yet very tasty fish dish that I discovered in a little Algerian village on the Mediterranean coast. Walking down a dusty road we were called to from a house with a hand written sign reading, ‘Restaurant’ hanging outside. Now even by Algerian standards, I think he was being a little over ambitious by calling himself a restaurant, two sets of plastic chairs and tables outside your house and a gas BBQ inside doesn’t quite make you a restaurant. Now when Westerners visit these parts of the World, they tend to avoid these sorts of eating establishments. Big mistake, I say! Ok, their hygiene standards might not exactly be up to the standards that you’re used to but you’ll often find some of the best and most authentic food that you’re likely to come across. So we sat down, were served a very nice glass of freshly squeezed orange juice and I ordered the simply named ‘fish with peppers’, from the hand written menu. I’ve got no idea what fish was used, I did ask but to be honest didn’t understand the answer. Neither my French or Arabic is very good when it comes to types of fish so I’ve been using mackerel when making this at home which seems to work very well. Dice the pepper and chilli and fry over a medium heat until the pepper is just starting to soften. Add the mackerel, skin side down and drizzle the juice from half a lemon over. After three minutes, flip the fish and add a handful of chopped coriander. Cook for another three minutes and serve with the flat bread and perhaps a salad. I did take a photo of this but it my phone’s decided to have a funny turn and wont let me upload it so you’ll just have to imagine what it’s going to look like (it’s a chilli so wasn’t particularly attractive anyway). I got chatting to a friend last night at the swimming pool so was a little later home than usual. Because of that I needed something quick and easy to do for dinner. 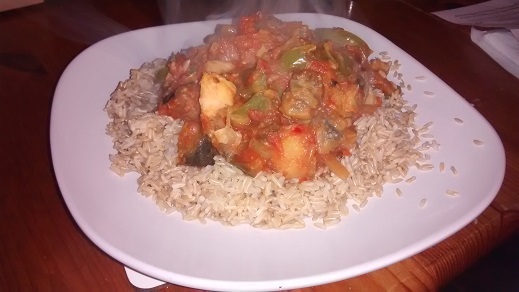 After a quick hunt through the fridge and cupboards I came up with this vegetable chilli. As it seemed to go down well with the family and as it’s nice and simple to rustle up I thought I’d share it. Slice the onion and pepper and sweat over a low heat until the onion is soft. Place all the vegetables in a pan, add the kidney beans, tomatoes spices and a splash of balsamic vinegar. Cover and simmer for 15 minutes or until the aubergine is soft. Serve up with rice or perhaps in tacos or with tortillas. This recipe is based on one that my nan used to often make for us when we’d visit her as kids. Great memories of her always come flooding back to me when ever I make it (although mine is never anywhere near as good as she used to make it). It’s an old Algerian recipe which is quick and easy to cook and has some lovely flavours from the spices and a good zing of lemon. 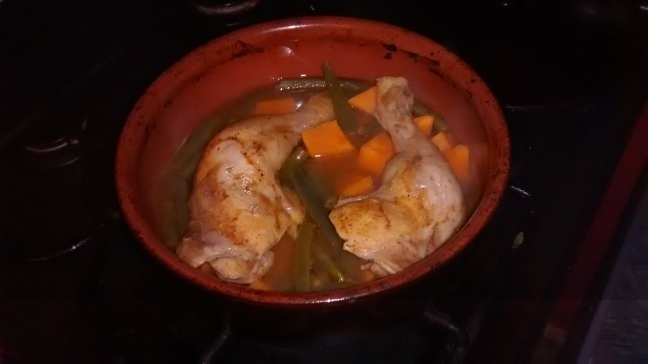 Place the chicken, vegetables, spices (incluiding any left over Ras El Hanout) and chicken stock into a casserole or tagine. Add the zest and juice of half the lemon and mix in the honey. Finely slice the remaining lemon and to the pot. Cover and cook in a moderatly hot oven (gas mark 6, 200C, 400F) for 30 minutes or until the chicken is cooked and the vegetables are soft. Who doesn’t love a good, Friday night curry? The only problem with your local Indian Takeaways are that they’re not exactly very good for you are they? So, if like me you’re trying to be good before the inevitable over indulgence that is Christmas just around the corner, this recipe might be just perfect for that end of the week curry craving. It’s quick and easy to make but best of all, it’s low in fat and packed full of all things that are good for you. It’s completely vegetarian and vegan friendly too. Peal and dice the potatoes and aubergine into 2-3cm cubes. Slice the onion, pepper and chilli. Steam (or boil) the potato for around 7-8 minutes. Fry the onion, pepper and chilli until the onion begins to soften. Transfer all the cooked ingredients to a large pan, add the tomatoes and curry powder, cover and simmer for 10 minutes. Serve with rice and a naan bread. I’m not really one for having a sweet tooth, chocolate, take it or leave it. But baklava is something that I can very easily munch my way through until the cows come home. 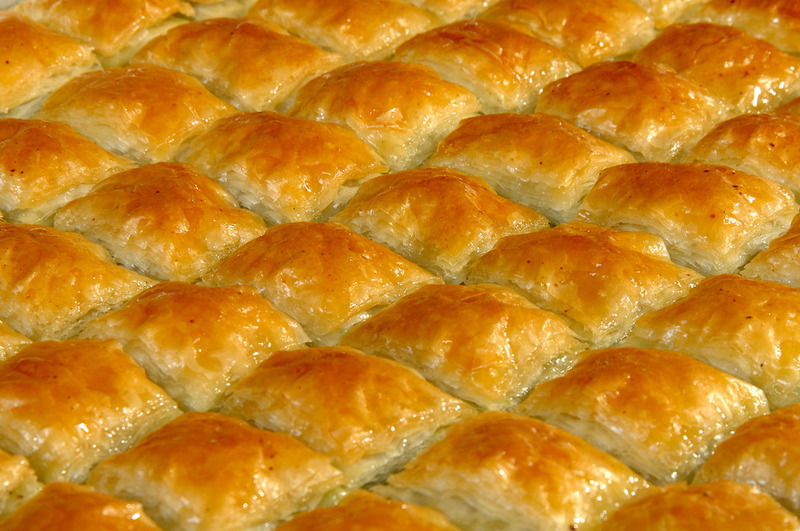 Apparently baklava originated in Ancient Rome, where it spread to Greece and Turkey and now variations can be found all over Greece, Turkey, the Middle East and North Africa. This recipe is for a Persian style Baklava made with almonds, pistachios and flavoured with a lemon and rose syrup and which tends to be drier and lighter than the Turkish or Greek versions that you’re probably more familiar with. Firstly, make the syrup. Bring the water to the boil, add the sugar, cardamom and juice from the lemon. Boil the sugar solution from 5 minutes, stirring regularly before removing from the heat and adding in the rose water and leaving to cool. Mix the chopped nuts in a mixing bowl and add around half of the lemon syrup, setting the rest aside. On a greased baking tray, lay a sheet of the filo pastry. Brush the pastry with the melted butter before laying a second sheet of pastry on top of the first. Brush this sheet with butter and add a third. Keep building up the layers of pastry in this way until it’s 7 layers thick. Spread the nut mixture over the pastry. Place a sheet of pastry over the nut mixture and build up the layers in the same was as you did earlier until it’s 7 layers thick. Using a sharp knife, cut the baklava into diamonds and place in a moderately hot (gas mark 6, 200C, 400F) oven for around 20 minutes or until the pastry as turned a lovely golden colour. Remove the baklava from the oven and allow to cool. Once cool, pour the remaining syrup over the top and dust with icing sugar. Duck is something that you usually associate with Far Eastern cuisine rather than North African but this is a little recipe that I came up with a while back. I was playing around with various mixes and sauces one afternoon when I came up with this and thought to myself that it’d go beautifully with the duck that I’d seen at my local butcher’s earlier on that day. So out I went to buy myself a duck and gave it a go. I must say that I was very pleased with the results and it quickly became one of my favourite duck dishes. One interesting point, I have had people ask me about using white wine vinegar in North African or Arabic cooking. There do seem to be some differing opinions but wine vinegar as it does contain no alcohol is generally accepted to be halal. Score the skin of the duck breasts but don’t cut all the way through to the meat. Very lightly oil a frying pan and heat until smoking. Place the duck breasts skin side down into the pan and cook for around 6 minutes. The skin should be a golden colour. Flip the breasts and seal the other side for 30 seconds before covering in foil and placing in a moderately hot (gas mark 6, 200C, 400F) oven for 12 minutes. I like to cook duck, medium rare, feel free to adjust the cooking time accordingly to suit your tastes (10 minutes for rare, 15 minutes for medium, 20 minutes for well done). After 10 minutes, remove the duck from the oven and rest for a further 10 minutes. To make the sauce, bring the stock, vinegar and honey to the boil before adding the spices and chilli. Plate up the duck, pour the sauce over the top and serve with couscous, mashed sweet potato or vegetables. What to do with the meat that’s left over from a lovely Sunday roast dinner? Well there are quite a few things that you could make with it, rissoles, curry, tagine, but the firm favourite in my house is always the good old shepherd’s pie. 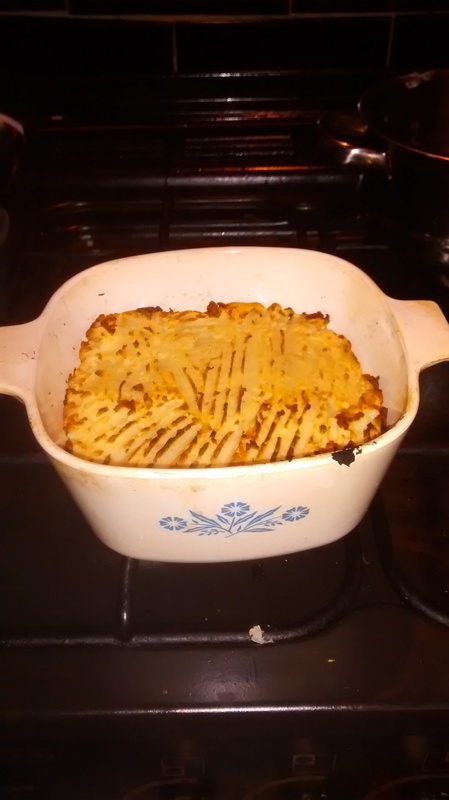 If you want to be really picky, shepherd’s pie should be made from lamb and cottage pie should be made from beef but to be honest you can use what ever meat you need to use up and call it what you want, it’s still always yummy. I’m going to give you the basic recipe for this family favourite but there are a few interesting variations on the recipe that you could try. Add some whole grain mustard to the mash potato if you’re using beef, an apple and celariac mash works really nicely with pork. Some people like to add carrots or tomatoes to the meat, experiment and see what you like. Me, personally, I like a nice simple shepherd’s pie. First make the mashed potato topping. Peel and chop the potatoes into chunks and boil or steam until soft. Pop the potatoes into a large bowl, add a knob of butter, splash of milk and mash until smooth. If it’s looking a little dry then feel free to add extra butter or milk to get the consistency that you want. If you’re using raw mince then you’ll need to brown the meat in a frying pan first. If you’re using cooked left overs, you can mince the meat and use it straight away. Finely chop the onion and fry until soft then put aside. Put the meat into a casserole dish and add just enough stock to moisten the mince. Season with salt and pepper to your taste and add the chopped herbs and onion and mix in. Top the meat with the mashed potato, you could also add some grated cheese to the top of the mash if you wanted. Leave the lid off the dish and put in a moderate oven (gas mark 4, 180C, 350F) for around about 30 minutes or until the top of the pie is a lovely golden brown. Serve with some steamed green vegetables. apologies for the rather rustic appearance, I’ve lent my nice tartlet cases to a friend so had to use a pie dish. This tart could be served with a salad as a light lunch or with boiled potatoes or potato wedges to make a more substantial dinner. I love the combination of caramelised onions and apples with balsamic vinegar and that’s what makes the base for this tart. With tangy goat’s cheese melted over the top and the spicy heat that comes from the chorizo it all comes together nicely to make a really yummy little treat. Slice the onion and apple. Melt butter in a small pan. Add the onion, apple and balsamic vinegar, cover and cook over a low heat for 40-45 minutes and then set aside. 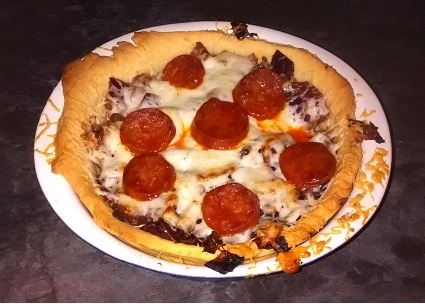 Put the balsamic onion chutney into the tart case, grate the cheese over the top and add the chorizo. Bake for a further 20 minutes. My love for food comes from my Nan who was probably one of the most amazing cooks that I’ve ever known. When we were kids, we’d often visit my Nan for dinner and I’d always go around early to help her cook. Her infectious passion for cooking and the exotic style of her native Algeria rubbed off on me and hopefully I can share some of that through this blog.